And while it may seem otherwise, social media’s shift to video is great news for bloggers – in fact, Facebook’s sound-off environment (which may or may not be changing), which lends itself to require in-video text, can give bloggers the upper hand in the new social video landscape. Here are three examples of bloggers who are increasing their reach on Facebook with video, along with tips that you can incorporate with your video efforts. On Simply Recipes, Elise Bauer utilizes square video to share family-friendly recipes and drive traffic to her blog posts. Her videos stand out on social, and Elisa’s square formatting enables her to better catch the eye of potential followers – her square videos got twice the engagement on Facebook than landscape videos. In fact, by incorporating square video into each post she continually expands her reach across multiple social platforms, and fosters interest in her written content. For instance, the Facebook video above uses bite-sized content paired with a click-worthy link back to a related post. “People like to see things move” says Elise. Video enables her to provide value to her readers – a crucial aspect of cultivating a loyal readership – in a quick, and engaging way. Furthermore, adding video to her blog has a direct impact on SEO, driving traffic to the Simply Recipes site. Keep in mind, when creating social videos, format is key. While running an A/B test of square vs. landscape video, Elise found that square videos were significantly more successful when it came to average engagement, views, and completion rate. So, if creating video content for social media, consider the square format. Tiffany Dahle of Peanut Blossom is always looking for ways to improve her readers’ experience by sharing content that’s relevant to them. By creating valuable content around major holidays she reaches new audiences, and establishes trust with her current following – most recently, Peanut Blossom amassed 1.4 million views with a holiday how-to video posted to their Facebook Page. The video’s reach was amplified when shared by 14,000+ other users. As a readily available tool that encourages social sharing of content, video rejuvenates Tiffany’s readership. Major social platforms like Facebook and Instagram give bloggers who use video a clear advantage, prioritizing their content in users’ feeds. 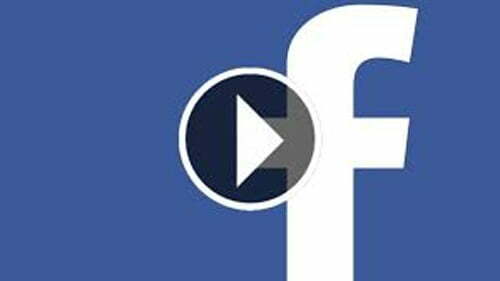 Facebook has even altered its algorithm to favor video posts over static images, or links. Incorporating seasonal, shareworthy video into a social media marketing strategy, as Tiffany regularly does, creates concrete opportunities for word-of-mouth marketing, by giving followers content they’ll likely engage with. Viewers liking, commenting, and especially sharing content translates to credibility for a blog, and access to brand new audiences. Essentially, a Facebook video functions as an ad for a blog post – it entices viewers, and converts them to loyal, avid readership. Give viewers and readers an opportunity to interact with a blog by including a call-to-action that encourages them to like that blog’s page, or share the video. Take advantage of seasonal trends and don’t forget to include text. As with writing, creating social videos requires familiarity with your audience, and a knack for words. Interestingly enough, video content which includes text performs best, making video an easy transition for bloggers. In the case of Happy Pear, the blog’s relatable language and bold text attracts viewers in the first few seconds of their Facebook video. Once their audience is hooked, Happy Pear encourages further engagement by linking viewers back to the blog, and asking them to subscribe. Instead of losing their audience with a long-winded post, the blog uses video to keep information concise, and make their call-to-action clear – a strategy that has worked for them, growing their following with each video they post. As many as 80% of mobile videos are watched with sound off. Ultimately, optimizing for mobile goes hand-in-hand with including text in videos. This is why writers have an edge when it comes to Facebook’s video-first algorithm much like written content, videos need to be informative and useful to an audience. As we head further into the video-first landscape, it’s natural that more and more viewers will prefer video over a written blog post. Blogs and publishers which recognize that change are capitalizing on it, increasing readership and conversion by adding video to their social media strategy. Unlike written content, video is easily digestable on the go. It affords bloggers the opportunity to entice readers, exciting them about blog content quickly and encouraging them to share that excitement with others. Bloggers have the unique ability to leverage their writing prowess and produce results-driven video content. That means video functions as a teaser for written content, or can be included as an introduction to a whitepaper or podcast. In 2018, the answer to successful blogging is as simple as adapting to, and participating in, the video-driven social arena.